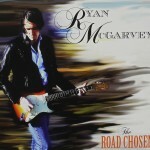 Share the post "Album review: RYAN McGARVEY – The Road Chosen"
Here’s an album that almost slipped through the cracks, but given it was released in late November last year and consequently missed ‘the best of’ lists, I think we’re allowed to sneak into the 2015 reviews. ‘The Road Chosen’ is an excellent independently released album by New Mexico based blues-rock guitarist Ryan McGarvey, a fiercely independent artist who operates without an avalanche of PR. Indeed his relatively high profile in Europe has come on the back of relentless road work as he brings his music to the people on their doorsteps. It’s a strategy that has paid dividends in terms of building things from the ground up and has led him to appearances at several leading Euro blues-rock festivals. He’s also copped several awards, including Best Guitarist at the European Blues Awards. Given the effort that has gone into the CD, its pleasing to report that he’s managed to transfer his spontaneity, energy, creativity and energetic spark into a stylish album full of good songs, strong melodies and intuitive solos. Ryan is a thoughtful song writer, an emotive vocalist and a cool guitarist with a welcome sense of restraint, though when he does lean into a full blooded guitar solo on ‘Fading Away’, a sudden fade robs us of a special moment. His solos and wide array of tones are always delivered as an integral part of the song rather than the song being a vehicle for a million notes. He’s best when he grooves with his road tested band, as on the riff driven, beautifully sculptured ‘Little Red Riding Hood’, which is full of big tones, potent chord changes and a sudden funky wah-wah break that leads into an uplifting solo, before its all too suddenly over. He’s a artist in the old school sense of the word, who eschews the conveyor belt approach to releasing out 2 or 3 albums a year – we usually have to wait a few years between each release – because he’s not the sort of guy to record anything unless he’s got something new to say. He works in a wide musical landscape that takes in blues, rock, funk and soulful ballads with real substance. He sings from the heart, to suggest that the emotion of a song is everything, while his playing mirrors the intensity of say Chris Duarte and the tonal intricacies of Eric Johnson. He’s also a road warrior who undertakes back-to-back tours of the US and Europe, and then promptly does it all over again. His nomadic lifestyle makes ‘The Road Chosen’ an aptly titled album, full of grooves, sparkling guitar tones, plenty of drive and a flow that levers us into the opening distorted tone of ‘Memphis’, to propel us through a seamless musical journey that comes to rest on the choogling beat and jangling guitars of ‘To An End’. The fact that he’s an multiple award winning guitarist who was co-opted on to Clapton’s ‘Crossroads Festival’ and is championed by Joe Bonamassa, is more of a reflection of his relentless work load rather than the result of PR hype. This album confirms that he’s the real deal, with hand crafted songs and expansive arrangements sung with real passion, as evidenced by the acoustic-into-electric ‘My Heart To You’. The latter employs a deliberaty stuttered mid-number rhythm before his quivering guitar ascends into the apex of a heartfelt ballad. ‘The Road Chosen’ channels its intensity into a guitar driven set of songs, while the instrumental ‘Firework Eyes’ sounds like a natural extension of what’s gone before, as a flurry of notes and sharp harmonics give the album a notable lift. The following ethereal sounding ‘Burnin’ Love’ reaches back to the angst of his early career ‘My Sweet Angel’ with a wonderful blend of shimmering tones, impassioned vocals and a wall of sound that envelopes us. ‘Always And Never’ is an introspective love song that deftly combines acoustic and electric to find the perfect balance that lies at the heart of an exhilarating album. This entry was posted in ALBUM REVIEWS, ALBUM REVIEWS (Mobile), All Posts and tagged album, blues, Chris Duarte, Eric Clapton, Eric Johnson, funk, grooves, guitar, Joe Bonamassa, review, rock, Ryan McGarvey, The Road Chosen. Bookmark the permalink.